Have you ever hid a comic book under your mattress? Of course, why would anyone do that? Better than reading a book—or so I thought at the time. When your mother is a teacher, comic books are “a corrupting influence that encourages children to look at pictures, ignoring the words that are basic to reading, and limiting their vocabulary.” That was her personal opinion of the genre. Such was also the model of good parenting, until Art Spiegelman saved our lives by elevating comics to a work of art with his graphic novels. Using the visual cues of comic books and pairing them with poignant subject matters and well-written words, Spiegelman influenced what would become a genre of its own. We are, after all, becoming an increasingly visual society. His graphic novel “Maus” was groundbreaking – a novel, in comic book format, which dealt with the Holocaust in a thoughtful manner and won him a Pulitzer Prize (1992). No wonder he is being honored with a Himmel Award this weekend. 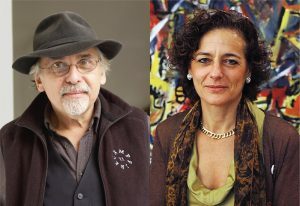 Collaborating with his wife, Francoise Mouly, these two funsters have rocked the art world with their project RAW, a comics magazine and anthology among other visually-rich projects. She is art editor of The New Yorker, which has one of the funniest covers on the newsstand. He’s a fun loving graphic novelist. Imagine what it would be like to be a fly on their kitchen wall. Well you can find out on Sunday April 8. Both will be honored at Katonah Museum of Art’s annual Himmel Award and Lecture, named in honor of our board member Betty Himmel. The award recognizes the “creators, conceivers, radical thinkers, and risk-takers that provoke new thinking in art and design. This Sunday, the couple will engage audiences in a conversation about their work and collaborations, and they will touch on “how artful text and image can raise social consciousness.” Something my mother would be proud of.